Precautions You Need To Take While Selecting Clothes For Your Pet! Choosing pet clothes is not a simple task as you need to select them according to pet’s comfort, according to weather and occasion. In case you don’t have summer clothes for your pet then the first thing to do is go shopping for your pet. 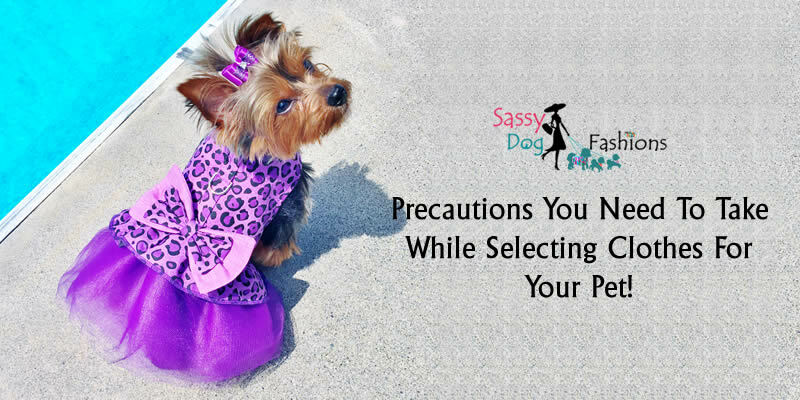 You can purchase online clothes from www.sassydogfahions.com as well because they provide the best quality and adorable clothes for the pets. So, while shopping, you need to keep the climate in mind. For example, if you want to get your hands on some summer clothes for your pet then you need to shop accordingly. For example, you can choose the kind of clothes and stuff that are cool enough for your pet and will not make him feel warm and irritated. Don’t ever put all the personalized pet apparel or accessories at once on your pet. Putting the shirts, boots, tie or even a collar at the same time will end up irritating your pet and it will make them look very uncomfortable. You have to keep it simple; in case you are putting the boots then you don’t need to put a shirt, just end up the look by putting a cute bow tie or a custom leather dog collar. Similarly, along with t-shirts, you can just put a collar otherwise nothing else is required. Selecting the right color for the right thing is best; dress your pet according to the event. For example, if you want to dress your pet for the outing in summer then selecting any t-shirt with a dog hat is best. While dressing up your pet for any summer outing, you need to always choose the clothes by keeping its comfort in mind otherwise your whole struggle and money will get wasted. If you dog is comfortable and happy with the clothing then you will get the best outing photos otherwise get ready for the bad ones. If you are not able to find the perfect comfortable clothes for your pet then check out the clothes at Sassy dog fashions (www.Sassydogfashions.com). These are a few things you need to keep in mind while selecting clothes for your pet. Make sure you follow all of these.